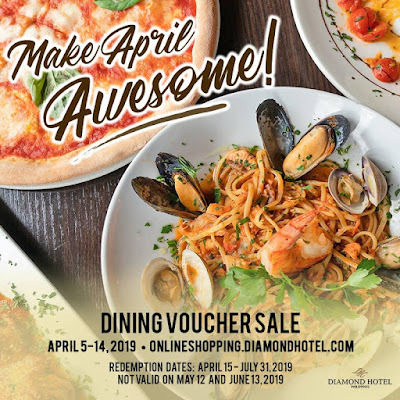 Diamond Hotel is making this April capital-A AWESOME with an ONLINE DINING VOUCHER SALE! Manila Diamond Hotel’s Lobby Lounge, Bar 27, and Corniche P2000 dining voucher for only P1,000 (that means, you get P1,000 discount)! Buy your vouchers online until April 15, 2019. Voucher is valid from April 15 to July 31, 2019. Voucher may be used as full or partial payment for any food and beverages availed at Manila Diamond Hotel’s Lobby Lounge, Bar 27, and The Corniche. •Voucher may be used as full or partial payment for any food and beverages availed of at the Corniche, Lobby Lounge, and Bar 27. • This purchase is inclusive of service charge and government taxes. • May not be exchanged for cash nor replaced when lost or stolen. • This may not be used in conjunction with other promotional offers and discounts. • Table Reservations must first be made three (3) days in advance due to limited slots by calling (02) 528-3000 ext. 1121. • A printed copy of the emailed Purchase Confirmation Receipt and a valid government-issued ID are required upon redemption or pick-up date. No name changes will be accommodated. If the Purchase Confirmation Receipt will be transferred, a valid ID of the original owner and an authorization letter together with the Purchase Confirmation Receipt has to be presented when redeeming the service. • The actual credit card used must be presented upon redemption otherwise a copy of front and back of valid credit card, letter of authorization from the owner of the card and a valid government issued ID must all be presented upon redemption. For any concerns or inquiry, please call 528-3000 at local 1121 from Monday to Friday, 10am to 7pm. Failure to present above-mentioned requirements upon redemption, the online payment becomes invalid and guest will be asked to settle on personal. Buy your vouchers HERE for Corniche. Buy your vouchers HERE for Diamond Hotel Lobby Lounge. Buy your vouchers HERE for Bar 27.